STRASBOURG, France (Bloomberg) -- A European plan to test cars' pollution under real driving conditions may survive a veto threat this week, signaling that the Volkswagen cheating scandal has done little to reduce the auto industry's political influence. The European Parliament will vote Wednesday on whether to let real-world emissions of nitrogen oxides exceed permissible discharges by as much as 110 percent between September 2017 and January 2020 and by up to 50 percent thereafter. While the assembly's environment committee recommends the proposal be rejected as too lax, European Union governments and the EU's industrial-policy chief are working to gather support for it. The plan's backers, which also include the European Automobile Manufacturers' Association, say surpassing the EU NOx limit of 80 milligrams a kilometer by more than twofold is less important than introducing road checks to complement laboratory testing given that discharges under actual driving conditions are 400 percent to 500 percent higher than in labs. To win over EU Parliament members, European Industry Commissioner Elzbieta Bienkowska has pledged to review the 50 percent overshoot ceiling and to move to enforce the legal cap no later than 2023. "It's a compromise at the end of the day, but there are serious signs it can fly," Matthias Groote, a German member of the 28-nation Parliament's Socialist group, the second-biggest faction, said in an interview on Monday evening in Strasbourg, France. "I can live with it." 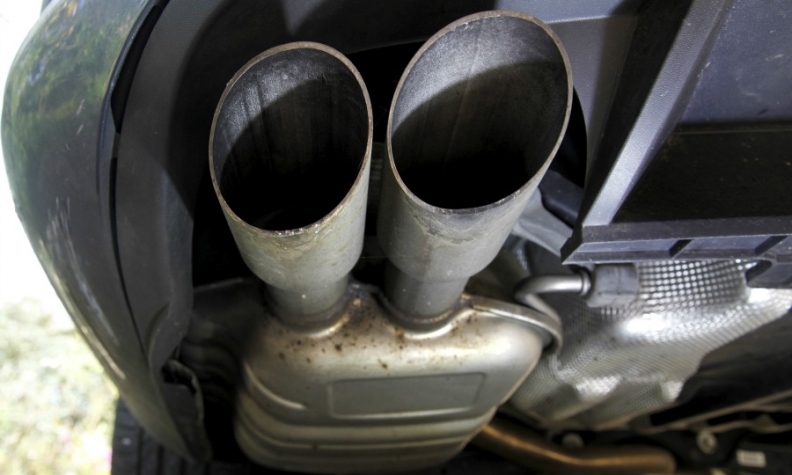 With sluggish economic growth, high joblessness and a car industry that employs almost 6 percent of the workforce, according to some estimates, the EU is seeking to balance consumer and producer interests after VW admitted in September that it fitted diesel engines with software to cheat U.S. checks on NOx discharges. The deception, which the U.S. uncovered and will eventually lead to an EU-wide recall of 8.5 million Volkswagen vehicles, is politically thorny in Europe because more than half the cars in the region are powered by diesel -- which causes more urban pollution than does gasoline while having less global-warming impact -- and because many member states have struggled to meet clean-air goals meant to reduce human sicknesses and premature deaths. The battle over new testing in the 751-seat EU Parliament pits lawmakers keen to brandish their environmental credentials and to engage in institutional muscle-flexing against auto-industry allies and members with national loyalties. The real-driving-emissions test plan that's on the table was approved by EU governments on Oct. 28 after they rejected a tougher proposal from Bienkowska because of concerns about extra costs for carmakers. Since failing to push through her original plan, which would have allowed a maximum 60 percent overshoot of the EU NOx limit for two years from September 2017 and enforced the legal cap as of September 2019, Bienkowska has championed the watered-down deal. At least 376 members of the EU Parliament will need to follow the environment committee's recommendation for the rejection to have legal effect, meaning an abstention would essentially count as a vote in favor of the agreement among governments. The environment committee passed its rejection recommendation on Dec. 14 by a vote of 40 to 9 with 13 abstentions. With the Christian Democrats, the largest group with 216 seats, and the 75-strong European Conservatives and Reformists - - the No. 3 faction -- planning to vote against the veto recommendation, the focus is on the Socialists with 190 members. "There is a lot of pressure on the Parliament to give in," said Bas Eickhout, a Dutch member of the assembly's Green group, which supports the environment committee's veto recommendation. "The Socialists are the swing vote." What especially annoys opponents of the plan drawn up by EU governments is that it would allow real driving emissions of NOx to be as high as 168 milligrams a kilometer between September 2017 and January 2020 -- a level that's closer to the EU's previous Euro 5 standard of 180 milligrams a kilometer than it is to the current Euro 6 limit of 80 milligrams. Both those EU caps are supposed to apply to discharges by cars "in normal use" and were approved by the EU Parliament as well as national governments about a decade ago, raising concerns that technical rules meant to underpin standards actually weaken them. That isn't stopping EU nations such as relatively green-leaning Denmark from pressing the Parliament to fall into line on the real-world test plan. In a letter to the leader of the assembly's Socialist group, Danish Environment Minister Eva Kjer Hansen said it's unrealistic to expect EU governments to accept tougher overshoot limits and a veto of the current plan -- which takes the form of a regulation -- would delay the introduction of real-driving-emission, or RDE, checks. "As much as I share your desire for more strict requirements in the regulation, I urge you not to use your veto power," Hansen said in the Jan. 21 letter. "That would only further delay new RDE requirements for type approval, and I believe it is highly speculative that a better result could be obtained in a new process."